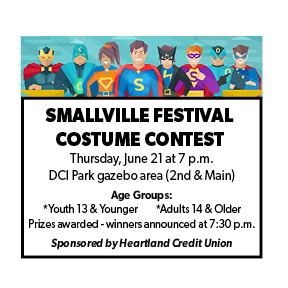 Thursday, June 20 at 8 p.m.
All ages will enjoy our NEW Smallville 5K & Super Hero 1-mile fun run/walk as a part of the Third Thursday Smallville Festival on June 20th. Enjoy this twilight run in the heart of Downtown Hutchinson, where participants will run loops with a crowd cheering them on. The Super Hero 1-mile fun run/walk starts at 8 p.m. and will include one, 1-mile loop. This fun event is open to all ages and levels and we encourage participants to wear their favorite super hero costumes! The Smallville 5K starts at 8:30 p.m. and will include three, 1-mile loops. Celebrate our town with a FUN and festive twilight race! All participants will receive race shirts and finisher’s medals. Sign up to receive email updates from Hutch Rec about our community race events. Thursday, June 20, 2019; 1-mile starts at 8 p.m., 5K starts at 8:30 p.m.
*Also check out the street dance featuring classic rock band, Artifact (thanks to Hutchinson Governmental Employees Credit Union) and beer garden (thanks to Carl’s Bar) near 1st & Main when you have finished running/walking! CLICK HERE FOR THE COURSE MAP. Note: 1-mile participants will do ONE LOOP (untimed). 5K participants will complete THREE LOOPS (officially chip-timed). In the case of inclement weather, the event may be delayed up to one (1) hour from the original start time or canceled, depending on the severity of conditions. Safety of the participants is the top priority of the sponsoring organizations. Due to the costs of putting together an event of this magnitude, refunds will not be given. No makeup dates will be scheduled. Due to the magnitude of planning an event of this type, refunds will not be accepted, including those related to weather cancellations. We also do not allow transfer or purchase of bib numbers. For more information, please contact race director Jeff Johnson at jjohnson@hutchrec.com or (620) 663-6179. Thursday, June 20: Starting at 5:30 p.m., you can pick up your packet near our start/finish line area at DCI Park, 2nd & Main.